Do you have a picky eater? I’ve had several and I lived to write about it! A few years ago I said good-bye to dinner time disasters and short order cooking in my home. With a few simple (or maybe not so simple) changes my kids learned how to try new foods and eat what was served and your kids can too. 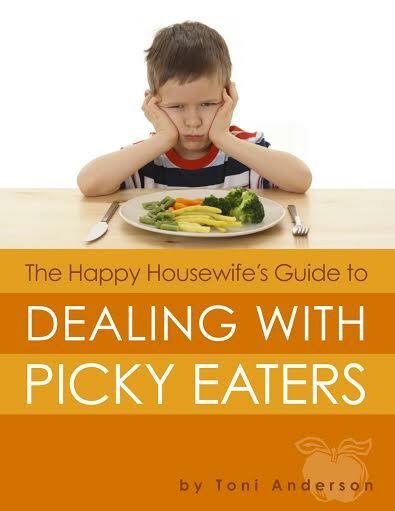 Order your copy of The Happy Housewife’s Guide to Dealing with Picky Eaters eBook today! Wow, thank you so much for the free ebook download! I haven’t read it yet, but I have two ridiculously picky eaters. I’m excited to read your book and really hoping I will find some helpful tips! Thank you for the ebook. My child was in the same boat since birth – in and out of doctors…gastroenterologists, pulmonologists, and nutritionists. Over 15 different “special” diets including for me when I was breastfeeding, formula concoctions, and limited baby foods. Tests for cerebral palsy, hirschsprung’s disease, and pyloric stenosis among others (with them still having no diagnosed what her problem is). Nothing stayed down and she was always severely constipated. While she’s not in the pain/discomfort she was during the first half of her life (she’ll be 3 next month), she still barely eats. Every little bit helps and I’m going to be putting this into practice at our house. Thank you again for this book offering!!! This looks like an excellent read! With 2 kids who will eat everything I serve, I know from first hand experience that there is definitely a strategy to getting your kids to eat what is served. how can I get a copy? I don’t have a facebook account….. Thank you so much for this book. I’m looking forward to reading it. My little one is more than just a picky eater, she has true feeding issues with several dietary restrictions. I am always on the look out for new tips. Thanks for sharing! I have tried all day to find where to say “Like” on this site. I signed up for the newsletter to get good info. Hunting all over was a failure.Trying to bring you up as an ad so I could Like this on facebook didn’t work. I have a low tolerance for failure. What What What am I supposed to do. There are many picky eaters in my family and all have health problems. Any and all help would be appreciated. You need to click on the link in the post. You can also click on the Facebook icon in the top section of the page. It will take you to Facebook and you can like the Facebook page, the click on the free ebooks tab on Facebook. I spent over an hour trying to figure out how to find your cookbook on facebook and on your website after I clicked “like” on your facebook. Is there another step that I am missing? If you are on the facebook page, facebook.com/thehappyhousewife, you will see a tab that says “free ebooks” it is to the right of the “blogs” tab. Click on the “free ebooks” tab and that page will have a link to the free ebook. Click on the link and the ebook will download automatically. Love the E Book and all the tips and ideas. 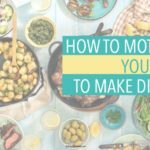 I’ve been posting several ‘Picky Eater’ recipes on my site recently, as we are going through this too with my son. I’ve learned that when you find one thing they like adding to it and making variations of it works well for us. For instance he likes meatballs so adding spinach and different veggies to them…he’ll eat them and never know the difference! Looking forward to following your blog! I would love to have a copy as well but also don’t have a facbook. I am taking care of two grandchildren and dinnertime can be difficult. Thanks for sharing your story and tips. You have no idea how much I need this!! I cannot wait to implement your ideas. THANKS! Help!!!!!!!!! I will be travelling very soon with an almost 4 yr. old picky eater who hasn’t “out grown” her fussiness. I don’t have an e-mail account. I really need to read this!! Can I get this another way. Just read your Ebook, thank you so much. I have 3 children with special needs & I also help other moms with specialneeds. I love that you discourage the substatution of healthy food for junk. you’d be surprised to hear how many moms have told me “he only wants cheetos” It makes me bananas. Thank you for such a wonderful ebook. I’m another that doesn’t have a FB account, but would like to read the book. . .is there another way? Thanks for the ebook. I can’t wait to read it. Just Like Carrie Ann my 2 yr old has been through the mill with gastro docs, heart, lung and we are celebrating 2 months off oxygen try and get a toddler to keep on oxygen. He is allergic to milk he breastfeed fine but would get the poops a lot well on busy days I would be so tired I would eat a bowl of cereal and go to bed. So now he is on soy milk and w/ no dairy this makes life a challenge for those of use who can who love pizza. I am still working on make menus it is a work in progress. Any chance I can get a copy of your ebook without FB? I’ve been fighting the food battle with my six year old since she started eating regular food. She likes food, but she doesn’t like any sort of foods that are mixed. That makes for some challenging meals. Thank you for making such great tools available to us! I’m an email subscriber and don’t do Facebook . . .can I still get a copy of your breakfast cookbook? You’ll have to contact Lynn, it is her breakfast cookbook. The link is on the post. Your book was a great help. I am dealing with a picky eater for a year and half now. But things are much better than before. Your book was the first after which I realized I am not alone in this. Now I have my own tips and tricks to get my toddler eat. Is the picky eater ebook still available? It’s a dead link on Facebook.